Few people in the LENR field seem to have recognized the three key insights revealed by the anomalous isotopic shifts observed in LENR experiments. The first insight is that, short of radioactive isotopes, anomalous isotopic shifts provide the most convincing evidence of nuclear reactions in the LENR field. The second insight is that they suggest the possible levels of energy involved in the reactions. The third insight is that they suggest the likely or, alternatively, unlikely mechanisms that may be responsible for these reactions. LENR evolved from an honest and courageous inquiry at the leading edge of scientific exploration. In 1989, Martin Fleischmann and Stanley Pons' best evidence was excess heat. They are world-class electrochemists, and calorimetry was their expertise. With custom-built tools, they made excess-heat measurements that were nearly unparalleled in precision. But excess heat did not carry the day in 1989 when the pair announced their discovery, because calorimetry meant nothing to the nuclear world. Twenty-one years have passed, many good books have been written and many good research studies have been performed. Calorimetry still means nothing to the nuclear world. First, some basics to bring all readers up to speed. Every chemical element has a specific number of protons in its nucleus. The number of protons defines the element's atomic number. The element helium, for example, always has two protons in its nucleus. Its atomic number is two. A finer gradation further defines most elements. These gradations are dictated by the number of neutrons in their nucleus. Some elements have just a few gradations; others have many gradations. These gradations are called "isotopes." The isotopes are identified by number, based on the total number of protons and the total number of neutrons in the nucleus. "Mass number" is another term that represents the total number of protons and neutrons in the nucleus of an atom. For example, helium has two isotopes. The first helium isotope has two protons and one neutron. This is called helium-3 (also written 3He, He3, or He-3). The second helium isotope has two protons and two neutrons. This is called helium-4. Carbon-12 has six protons and six neutrons. Two letters are often used as shorthand to refer to an element's atomic number and its isotope. The atomic number is denoted by "Z," and the mass number is denoted by "A." Palladium has six stable (that is, not radioactive) isotopes in nature. The key point is that, as a natural element, palladium always occurs with six stable isotopes, no matter where on earth it is found. Each of these isotopes always occurs as a specific percentage, an abundance, of the total amount of palladium in a given sample. Thus, the six stable palladium isotopes and proportions are 102Pd (1.02%), 104Pd (11.14%), 105Pd (22.33%), 106Pd (27.33%), 108Pd (26.46%), and 110Pd (11.72%). These isotopic ratios are effectively benchmarks. Isotopes from samples can be identified qualitatively and measured quantitatively and compared with the natural abundance. For example, the natural ratio of Pd108/Pd110 is 2.26. If researchers find that this ratio in a test sample is significantly different from the benchmark, they know something anomalous has occurred. The strength of this benchmark is that, in general, the only known cause for anomalous isotopic ratios is nuclear reactions. Ordinary chemical reactions cannot change isotopic ratios. With the exception of nuclear reactions, there are virtually no conventional explanations for anomalous isotopic ratios. In this article, we will examine several LENR experiments that reported anomalous isotopic distributions. Each of the experiments has several features in common, but some of them, based on the original research, provide specific vantage points from which to observe the key insights of nuclear evidence, energy production, and possible mechanisms. 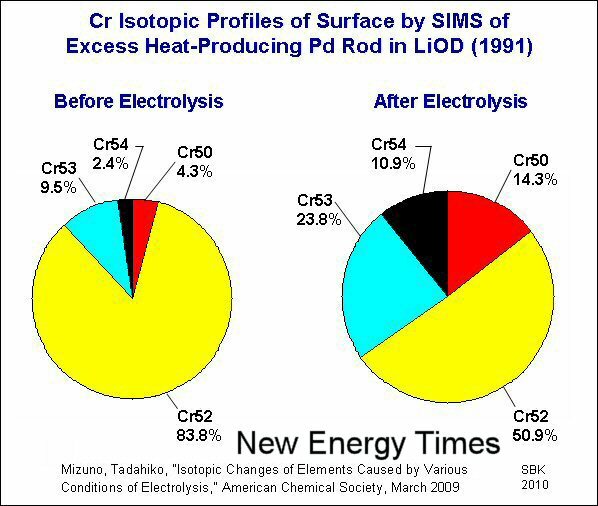 For example, the first image below graphically represents the changes to the palladium isotopic ratios that took place as the result of a heavy-water LENR electrolysis experiment performed by researcher Tadahiko Mizuno in 1991. A variety of significant changes is evident. The second image below, from the same experiment, also shows a significant anomalous shift in the isotopes of chromium. The transmutations of palladium and chromium are only a few of the changes Mizuno observed in this 1991 experiment. In addition to using SIMS (secondary ion mass spectrometry), Mizuno used AES (auger electron spectroscopy), EPMA (electron probe micro-analyzer), EDX (energy-dispersive X-ray spectroscopy) and GDS (Glow Discharge spectrometry). "Many elements were found and detected on the palladium surface and confirmed using several different analytical methods," Mizuno wrote. "These are apparently reaction products: several elements ranging from hydrogen to lead with mass numbers up to 208. “The isotopic abundance of selected elements detected after long-term electrolysis was found to be drastically different from the natural isotopic abundance. This phenomenon was confirmed eight times with good reproducibility. All sources of contamination have been carefully eliminated by repeated pretreatments of the sample and the electrolysis system." The transmutations observed in this experiment came from a Fleischmann-Pons-type heavy-water experiment, not a light-water experiment. This crucial point will be discussed later in this article. In November 1999, the Electric Power Research Institute published a significant "technical progress" report that has been hidden for 11 years. At some point when EPRI developed its Web portal, it began to place many documents online. In September 2009, this writer surveyed the available LENR papers on the site, but for TP-108743, EPRI had released only the abstract. The abstract itself was intriguing. Because EPRI had apparently placed all its other LENR papers online for free public access, New Energy Times asked EPRI to waive the significant but standard nonmember fee of $2,500 for this report. After several requests in the fall of 2009, EPRI declined. Later, in January 2010, after this writer had finished a meeting at SRI International regarding the SRI "M4" experiment, he drove to EPRI's headquarters, just 2 miles away in Palo Alto, Calif., to try again to gain complimentary access to the report. Several days after a friendly meeting with an EPRI representative, EPRI notified New Energy Times that the report was online. Oddly, EPRI included a cover page stating that the report had been made public on Oct. 22, 2009. One of the project managers who wrote the report is Thomas Passell, a former EPRI program manager who helped to fund millions of dollars in LENR research in the 1990s. A significant portion of those funds went to projects directed by electrochemist Michael McKubre, the director of the former SRI Energy Research Center, a program which continued until the late 1990s. Passell is an expert in nuclear chemistry; he studied under Dr. Glenn T. Seaborg at the University of California, Berkeley. As a nuclear chemist, Passell naturally appreciated the significance of isotopic abundances and their possible shifts. In the same way that Passell co-managed many of his LENR projects, Passell co-managed this one with EPRI project manager Albert Machiels. Passell and Machiels used what may be the most rigorous detection tool for both quantitative and qualitative elemental as well as isotopic analysis: neutron activation analysis (NAA). Samples of a material are placed in a nuclear reactor for a brief time and "activated" with neutrons. After the samples are removed from the reactor, the emitted gamma rays are precisely measured and used to characterize the material. It is a standard and well-trusted device in nuclear physics research. Passell and Machiels collaborated with principal investigators Ben Bush and Joseph Lagowski in the Chemistry Department at the University of Texas, Austin. They, in turn, collaborated with other researchers in the Nuclear Engineering Department at the University of Texas. There is at least one more significant player in this picture: Stanley Pons. Martin Fleischmann may be in this story, as well, but that fact is unconfirmed. The samples – sections of palladium cathode rods – that were tested in the University of Texas reactor came from an experiment conducted by Pons in the laboratories of the Toyota-sponsored Institut Minoru de Recherche Avancée in Nice, France. Exactly when Pons conducted this experiment is unknown. The experiment may have taken place in the mid-1990s, because Passell cites similar work by Pons, T. Roulette and J. Roulette published in October 1996. Like the Mizuno experiment, the University of Texas analysis shows a wide variety of transmutations. The researchers reported 4 times the amount of cobalt (Co), 5.4 times the amount of chromium (Cr), 2 times the amount of cesium (Cs), 1.3 times the amount of europium (Eu), 56 times the amount of iron (Fe) and 11 times the amount of zinc (Zn) that is found in the virgin material. 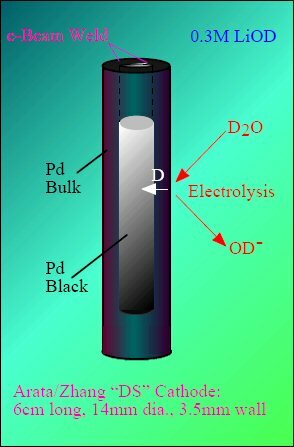 Electrolytic experiments, as opposed to gas experiments, are often but not necessarily easily critiqued for the possibility that rogue elements from the electrolytic solution may deposit on the cathode. However, some of these elements reported here represent rather large concentrations, and thus the credibility of such critiques wears thin. However, the nearly indisputable smoking gun is the anomalous isotopic ratio of palladium-108 to palladium-110. The EPRI report said, "Pd-108 was depleted in the active sample relative to the virgin material by an apparent 28% with the one sigma error limits extending from 7% to 49%." New Energy Times knows of no conventional explanation for this shift. According to the researchers, the Pons experiment produced lots of heat. The researchers who prepared the EPRI report did not know what type of nuclear process to attribute the reactions to. They speculated, based on their understanding of nuclear chemistry, "that the excess power episodes observed with the cathode integrated over the time of the episodes must have totaled 160 kilojoules." They also had information from Pons about similar experiments for comparison. "Pons of IMRA volunteered a cathode that had experienced such episodes of excess heat well above the required levels of several hundred kilojoules," the researchers wrote. "It was this cathode and its virgin counterpart that were analyzed in this study." The researchers were not given the excess-heat data from Pons, but they back-calculated the minimum amount of energy release based on the facts they obtained from the NAA along with their knowledge of nuclear binding energy. 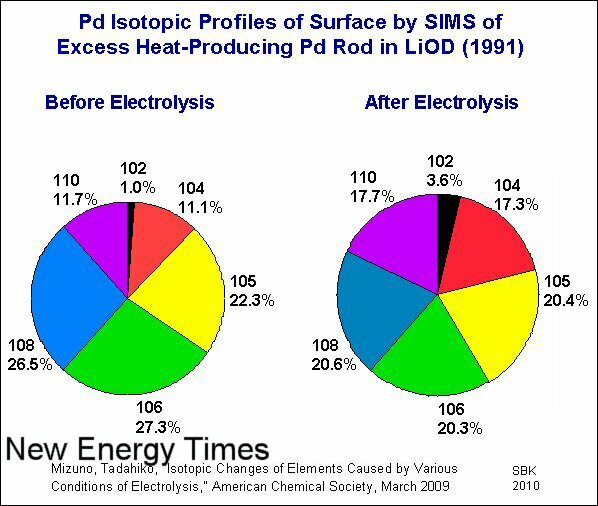 They based their interpolation on the most conservative estimate of depleted Pd-110 atoms (7%), and from this they extrapolated an amount of energy in the same ballpark as that which Pons had reported by calorimetry. If we take the 7% number as the value, this implies a loss of 2.3E18 atoms of Pd-108. At 10 MeV per atom lost, this amounts to 3.6 megajoules for the sample, and extrapolating to the total cathode assuming homogeneity gives 163 megajoules of excess heat. Of course, total homogeneity is not likely in the electrochemical cell. The total excess heat generated by this cathode has not been made available to us as yet. To get 163 megajoules of excess heat would require an episode with an excess power of 10 watts for 4,527 hours, or about 0.5 years. The conclusion we must draw is that homogeneity is unlikely for excess-heat episodes or that our measurement of Pd-108 depletion is in error. However, it should be noted that Roulette, Roulette, and Pons report one cell giving a total net excess heat of 294 megajoules and another yielding 102 megajoules. The transition elements Cr, Co, Fe, and Zn are possible fission products of Pd, for which the energy available from the mass change of about 20 MeV per fission or 10 MeV per fission product atom assuming binary fission. This is the only nuclear process we have imagined capable of producing these elements from elements in the cell. The Cs increase observed may be from the 0.1 Molar LiOD electrolyte, it being an alkali element similar to lithium. At the time, the researchers almost certainly had no idea of the possibility of real neutrons being generated in the LENR cell, and through weak interaction processes, neutrons might have been created and then captured by nearby nuclei. The depletion of Pd-108 compared to Pd-110 can be explained simply by the capture of two neutrons. As with the Mizuno experiment, these samples came from a Fleischmann-Pons heavy-water experiment, not a light-water experiment. Passell was a man on a mission; his search was for rigorous nuclear evidence for LENR, and he found it. He knew that some people wondered whether impurities from electrolytic solutions were partly responsible for the reported LENR transmutations (but not the isotopic shifts). Focusing on material exposed only to gaseous deuterium has the advantage that conventional electrochemical cathodic deposition from electrolyte impurities or extracts from anodes can be eliminated as a possible cause of observed changes. All these samples were protected from the electrolyte inside the gas-pressure-tight hollow core of the cylindrical cathode. Again, Passell used the services of the University of Texas, Austin, and performed NAA on the palladium-black powder from inside the core of the cathode. The most striking thing he found was 6.6 to 14.4 times the zinc-64 isotope over the virgin palladium. 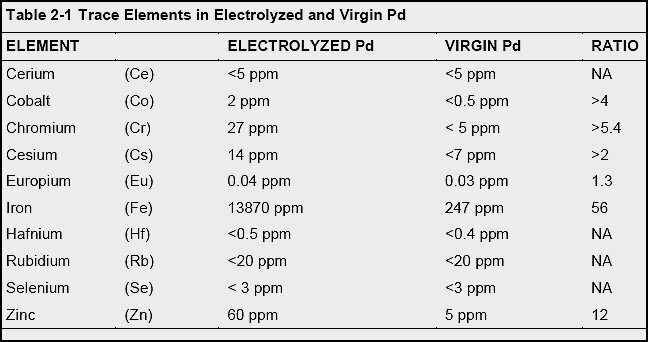 Passell was given three samples (A, B and C) from post-electrolysis experiments and one virgin sample (D). The fact that, for whatever reason, with the exception of zinc growth, sample B did not show the same performance characteristics as samples A and C with iridium, gold and Pd110/Pd-102 is striking. Several years later, Passell had arranged for further NAA studies on these same samples analyzing the isotopic ratio anomalies more extensively. Passell then attempts to speculate on the nuclear binding energy that would be released as a result of these nuclear products. The precise amount of excess heat produced by the cathodes in which the powdered palladium was contained has not yet been made available. Arata and Zhang’s published work shows data from similar cathodes which produced about 30 to 40 megajoules of excess heat over the most active two-month period of their electrolysis. If one assumes that some nuclear process produced each excess zinc-64 atom at about 10 MeV per atom, that some 12 grams of powdered palladium was contained in each cathode hollow core, and that our sample of 5 to 15 milligrams was a representative sample of the full 12 grams present, then one obtains expected excess heat of 20 Megajoules. The only heat-producing nuclear reaction capable of producing zinc-64 is the fission of palladium isotopes or proton capture in impurity copper. Although some copper impurity is undoubtedly present, it is not readily measured by NAA under these circumstances, and even if present, it is unlikely to be as large as several hundred PPM. Again, Passell almost certainly had no idea of the possibility of real neutrons being generated in the LENR cell and, through primarily weak interaction processes, producing such transmutations. In his 2000 paper, Passell also cited independent LENR work from a group led by Xing Zhong Li, in the Physics Department at Tsinghua University in China. Passell said that the group used a "completely different type of experiment" yet reported a similar anomalous isotopic shift with zinc. Li told New Energy Times that during the period from 1989 to 1998, the Tsinghua group performed a lot of work on LENR transmutation studies. They confirmed that nuclear transmutation appeared in both Pd-H and Pd-D systems. "The most severe alteration showed an enhancement of the Zn-68 to Zn-64 ratio by 20% relative to the ratio for natural zinc," Passell wrote. "Their unexposed palladium showed no zinc present." In writing this article, we did not attempt to conduct a survey of anomalous isotopic shifts in LENR systems. We looked primarily at the work managed by Passell. Most likely, there are many other reports of similar isotopic studies. Cold Water on "Cold Fusion"
Consider the following history: As early as 1989, Pons was open-minded and receptive to light-water heat, despite the fact that it disproves the "cold fusion" hypothesis, but Fleischmann had dismissed the credibility of light-water heat. In the mid- to late-1990s, Pons clearly was interested in transmutations because he gave a sample to Passell for analysis. Fleischmann had been reluctant to acknowledge LENR transmutations, which also contradict the "cold fusion" hypothesis. He finally and only reluctantly conceded the reality of LENR transmutations in 2004. Almost certainly, as of November 1999, Pons knew absolutely that "cold fusion" was not the predominant, if any, mechanism responsible for the excess heat in the Fleischmann-Pons experiments. Probably the greatest revelation in this work is the possibility that trace elements may be significant participants in nuclear reactions in solids such as palladium so that focusing entirely on D+D fusion is not necessarily the only path forward in understanding these phenomena. Heavy-water (D/Pd) systems do produce transmutations. LENR transmutations likely release significant amounts of nuclear binding energy. Separate and discrete mechanisms are not necessarily responsible for the phenomena observed in the heavy-water (D/Pd), light-water (H/Pd) and nickel-hydrogen LENR systems. The studies reviewed in this article cast great doubt on the claimed certainty by researchers and project managers such as Michael McKubre (SRI International), Peter Hagelstein (MIT), Michael Melich (Naval Postgraduate School) and Vittorio Violante (ENEA Frascati) who have made great efforts to measure heat and helium-4 in Fleischmann-Pons experiments or to promote such claims. Unless they make equally painstaking and sincere efforts to perform elemental and isotopic analyses, their claims of identification of a definitive energy balance between excess heat and helium-4 are meaningless. 4. McKubre, M.C.H. “Review of experimental measurements involving dd reactions” (PowerPoint slides), in Tenth International Conference on Cold Fusion, 2003. Cambridge, Mass. : LENR-CANR.org.